Chapel Hill’s academic program exceeds all State of Ohio standards and meets all requirements for the Association of Christian Schools International accreditation. Students, pre-school through 6th grade, have classes in art, music, Spanish and physical education with teachers specializing in these subjects. 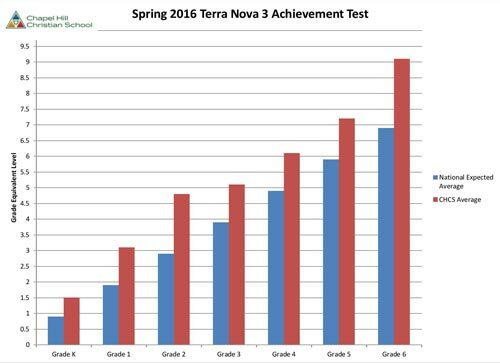 Each year, students take Standardized Achievement Tests to show their achievement in relation to national norms. Chapel Hill Christian School includes the moral training of children as their curricular responsibility. Bible is taught at each grade level and is studied as any other academic subject. Each subject, whether it is math, science, or history is taught from a Christian viewpoint following the basic premise that, if there is any truth in any subject, it must be God’s truth, since He is truth. “Knowing how to read, but not reading is the same as not knowing how to read.” At Chapel Hill Christian School, we want our students to know how to read using the best researched practices available. We also want them to enjoy reading and become life long learners. We do this in a variety of ways with teachers interacting with the best materials and strategies. In our primary grades, we use a strong phonics based reading program where children learn phonemic awareness, learn how to hear sounds, and transfer that to recognizing and using sounds in words. Good literature from our library is offered to help encourage children to read. Accelerated Reader (AR) is a web-based program that provides timely, accurate information on student reading performance which helps teachers quickly adjust instruction to help all students reach their greatest potential. Included in this program is the STAR test which helps determine reading level. Students choose a book within their individual reading level and after reading their book, they take an online quiz. They work toward personal goals to improve their reading skills as the year progresses. Our upper grades have similar goals with even more emphasis on reading strategies and skills that aid in comprehension. Teachers may use literature circles where students choose from a variety of novels. Students learn to recognize character development and plot development by the author. They discuss these elements of fiction with fellow students that are reading the same novel. As a school, we want to teach how to interpret not only the information that comes from content reading, but also God’s Word. We desire that our students become proficient at the skills of interpretation, predicting, and cause and effect. We teach these using drama, student-made devotions, or working with song lyrics. Our goals are to promote skills of reading, fluency, and a love of reading for a lifetime. Parents and/or teachers can refer students who may need help with reading skills to the to the Reading Mod. Students come in small groups or individually depending on the needs, at least twice a week from 30-45 minutes. Mrs. Walters works closely with the teachers to schedule students so that they miss a minimum amount of classroom instruction time. Mastering Math Facts is a structured program by Otter Creek Institute for sequential practice of math facts. Facts are introduced in sets of two and their reverses. The program is structured the same way for all four operations (addition, subtraction, multiplication, and division) so the teachers can implement a simple daily routine that can be followed all year and from grade to grade. Quicker learners can move onto master higher operations while slower students proceed at their own rate without disrupting the routine. Technology plays an increasing and important role at CHCS as we prepare our students with the needed “life skills” for the increasing demand for technology skills in all career realms. Each campus is equipped with a sophisticated network environment, equipped with web filtering and security protocols, while securely separating administrative, teacher, and student data and activity and maintaining a single unified internal network via a constant seamless remote connection between the two campuses. Each individual classroom has one or more dedicated Google Chromebooks or Google Chromeboxes for classroom use. Mobile carts of Google Chromebooks and Apple iPads are available for teachers to collaboratively utilize in their classrooms with students. All classrooms are also equipped with an interactive SMART Board® and projectors for further immersive engagement with students. Technology is used in the classroom with students in all grade levels. Kindergarten through 6th graders have Technology class once a week. 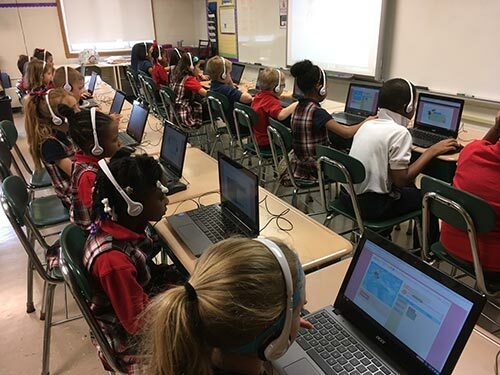 Along with learning keyboarding skills in various age appropriate ways, younger students use educational software that helps reinforce subjects and topics taught within the classroom. Older students begin learning word processing skills via Google Docs, give presentations using Google Slides, learn collaboratively via Google Classroom, as well as begin to practice proper online researching techniques. Our goal is to use technology to enhance a student’s learning experience in a way that prepares them for any technology based future in their educational career. 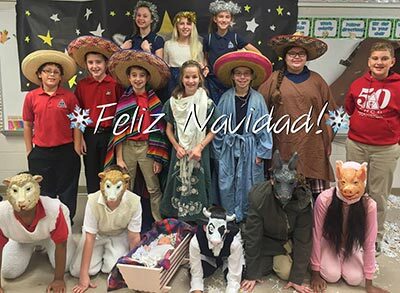 All students at CHCS, PK through 6th grade, attend Spanish classes one-half hour per week. Children are introduced to basic conversational Spanish, and enjoy learning the language through activities, songs, and games. The Spanish curriculum is designed in such a way that new students can enter CHCS at any grade level and be successful. While students review the vocabulary from past years regularly, they are only assessed on material that is new for all students.